In front of and behind the scenes a team of 70 members of staff are working hard every day to ensure guests staying at the Hotel Bergland enjoy a memorable holiday. If you have any questions or requests, simply speak to one of them. They will be happy to help. The many extras as standard and friendly service create the warm and welcoming atmosphere which characterises holidays with us in the heart of the Ötztal Alps. Johannes and his team provide fast, friendly and competent service in our restaurant. are happy to tell guests about what is on the menu and what they can recommend. help diners choose the right wine to go with their meal. are friendly and well-informed sources of information when it comes to food & drink. serve a selection of drinks at the Fireside Bar. always have time for a laugh and a chat. Madlene and her team look forward to welcoming you to the Hotel Bergland. process your enquiries and bookings. greet you at the hotel and offer you a welcome drink when you arrive. carry out phonecalls, provide copies of our hotel brochure, and send and answer letters, faxes and e-mails. know almost everything about the Ötztal Valley in order to help you with your questions and requests. help you pay your bill upon departure and wish you a safe and pleasant journey home. are responsible for both the virtual and tangible representations of the Bergland and take care of all press matters and enticing in-house advertising materials. present the hotel on social media platforms, publishing current news and special offers and fostering online friendships. allow creativity to flow freely and decorate the entire hotel according to a consistent theme. Lukas and his team cook up a storm in the kitchen. prepare our hearty and healthy breakfast buffet every morning. serve a multi-course gourmet dinner in the evening. create a selection of delicious snacks in the afternoon. use only the finest seasonal produce sourced from the local region. know that the way to a guest's heart is through his stomach. give you a warm welcome to the cosy, rustic Madlas and Schafer parlours. 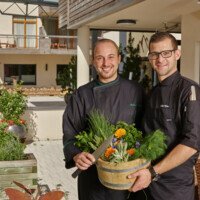 serve Tyrolean cuisine with a Mediterranean twist daily, from 18.00 until 23.00, from the beginning of October onwards. really value seasonal, regional products when it comes to cooking. are happy to let you taste a small glass of the many wines on our menu to help reach a decision. truly spoil you when it comes to dessert with exquisite desserts from our patisserie. Sigi and Elisabeth open doors and hearts … because they love sharing "their" home with others. 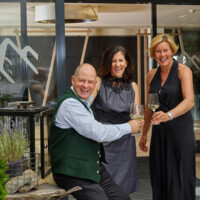 make sure that guests feel happy and at home during their stay in the Ötztal Valley. share customs and traditions from the Ötztal Valley with guests staying at the hotel. ensure that they use as many things as possible from the hotel's own farm, including lamb's meat, hay baths and homemade felt slippers. reopened the hotel in 2010 to continue the 60-year tradition at the Hotel Bergland. searches for suitable staff for the Bergland and finds them too. coordinates and monitors their work to ensure that the hotel runs smoothly. sees to administration, finances and the payroll. Julia and her team help guests relax and unwind at the Sky Spa. provide friendly expert advice on the training sessions and treatments available. 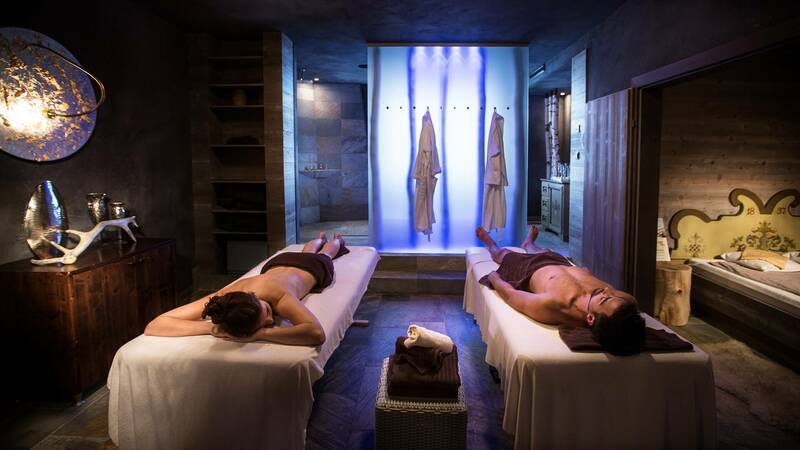 make reservations for selected treatments. show you how to use the fitness and cardio machines and help you with workouts and meditation. adapt the fitness and relaxation programmes to suit your personal needs and preferences. keep energy levels high with snacks and drinks at the Sky Bar. keep the spa area clean and make sure everything is in order. Lydia and her team make sure everything is clean and orderly during your stay at the Hotel Bergland. tidy and clean your room and bathroom every morning. change the towels, sheets and other items in your room. keep things looking spick and span throughout the hotel. Sepp and his team are on hand to solve any maintenance problems, big or small. monitor and repair the almost 3,000 lights in the Hotel Bergland. service the water supply, hygiene facilities and filters in our pool. solve all kinds of technical problems quickly and efficiently. tend to the plants, clean the driveway, keep the gardens looking tidy and are responsible for waste disposal. repair everything from electronic toys to high heels.